Online shopping for Anime Cosplay Weapons with free worldwide shipping. Naruto Anime – is a history of an adolescent ninja looking for recognition and aspiring to become the ninja leader of his village. Got inspired by this legendary kid, our Naruto cosplay weapons will upgrade your collection to a whole new level. 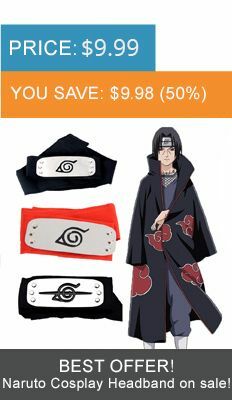 In this category, you will find high-quality replicas of used weapons in Naruto anime: Shurikens and Kunais. Searching for awesome Naruto Keychain? Look at these Naruto weapon keychains which keep your keys safe and can become a perfect gift for Naruto fans. In the popular anime, Sword Art Online, weapons are a part of main characters, Kirito and Asuna are known for their formidable swordsmanship. Our featured necklace showcases three of the most popular swords in the series; Kirito’s Dark Repulser and Elucidator, as well as Asuna’s rapier, Lambent Light.